Lovely villa, short walk from town, huge 76m2 pool, WIFI, SKY, etc. The Spanish villa 'La Noria' is beautifully set on a 2300 m2 plot in the exclusive area Valls/Seniola. With views over the valley and towards the Montgo mountain. It's just a few minutes walk to the old town. Great for a late night dinner or exploring the historical center. On the south side of the villa you'll find a large terrace with sitting area over looking a garden with a wide lawn for the children to play on. On the other side there is a mature garden with palms, orange trees, the pool area and wooden terrace (fully private). Ping pong table, dining area with extra fridge, BBQ, etc. Shaded areas to sit and relax. The interior is very spacious with open vaulted ceilings. The lounge and dining area is open plan in design. The kitchen is fully equipped. Dining table inside or outside for 10 people. Living room with fireplace, Sky sports, Bt sports(all soccer games), 50 inch LED, WIFI. Lounge area with sliding doors . There are 2 bedrooms with 2 ensuite bathrooms downstairs. Seperate toilet near the pool. Upstairs there are 2 more bedrooms (one suite size) and a shared bathroom. There is a highchair and travel cot for the baby. Also there are small children toys around such as a slide and toycar. The pool area can be closed off for safety. Every year, we ask renters how to make improvements (if there are any) to make sure the villa keeps a high standard. 5 minutes drive to the Mariott and golf course. Air conditioning in all the bedrooms. Wireless internet connection. SKY Sports and BT sports. Ping pong table. We stayed at Villa Noria for two weeks: two adults and four children. The location was perfect. You need a car to to to town and the beach (5 minutes), but that was only better. The house is located in a quiet area. Shops nearby. The house is huge. The swimming pool is fabulous. The service is great. We drove to check other places. Not worth it. Javea is the place to walk, swim and eat. We will certainly come back. 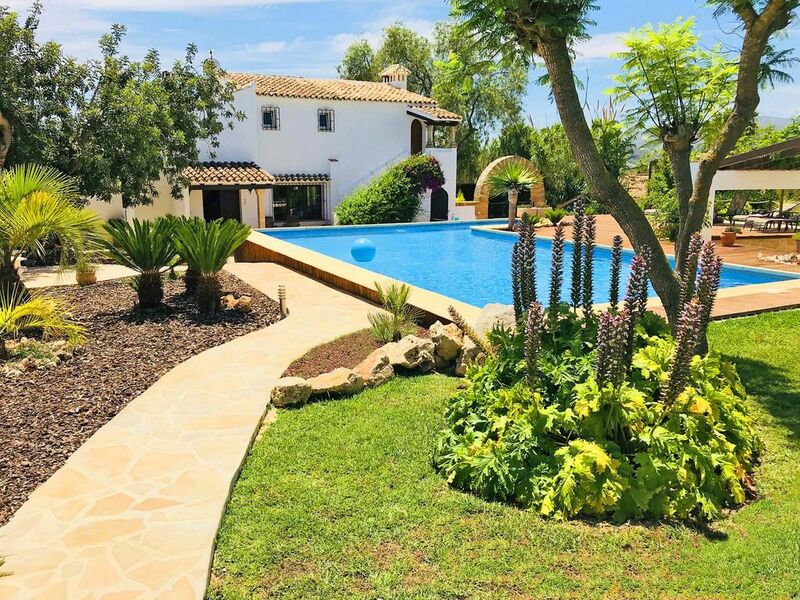 Where can I start with the villa beautiful, huge,fantastic pool, lovely garden, magnificent eating areas and everything you could need in a villa , my family and friends family had such a great time javea is beautiful old town if you like tapas you will fit right in . Walter and his wife are a credit to the place helpful and knowledgeable of the area I can't speak highly enough . I would love to keep this to myself so it could be our own little paradise escape but really if you are a family GO!!!! Thanks for the comments ! You're welcome to come back. Everything was great. If you are looking for a place to spend a relaxed vacation with your family, La Noria is THE place. I am happy to read you liked the villa that much ! We were impressed with this nice, clean and spacious villa; lots of space, seating areas everywhere along the large garden, great pool, great BBQ area, very well equipped kitchen. We would recommend this for couples, groups of friends, parents w children, a dog is no problem; completely fenced terrain. A car is needed to get around. We will be back for sure! Very friendly renters, welcome to come back ! I stayed at the villa La Noria in Javea towards the end of August 2009 with my family and we all enjoyed our stay enormously. Javea itself is a very nice town and quite unspoiled by "Costas" standards, with no high rise development at all. The villa is sited a short walk to the old town (the covered market is a definite visit Monday - Saturday). The beaches are that bit further and ideally either a car or bike ride would be best. The villa is very nice and as beautiful as the web site shows, although the pictures do not do justice to the interior. It is extremely comfortable and everything worked well. Despite the villa being handily placed to the main road into Javea port, it is still very quiet and peaceful. The welcome we received was very helpful, quite laid back and unobtrusive. We would all be hapy to visit Javea again and equally happy to stay at La Noria. All in all a lovely holiday. very good and correct clients. This villa is really pleasant for holidays. A piece of heaven. Every commodity are not far from the villa. Javea provides an opportunity for both a beach or mountain holiday. The main beach Arenal area has a bustling day and night life with local markets, a Historic town and fishing port with plenty of restaurants, terraces, pubs etc, in the surrounding areas. To forget the busy world of the city and business, to rest and relax, Javea is the ideal spot and a haven of scenic delight. The town with its 16th century church, covered market and fascinating narrow streets is sheltered by mount Montgo. Declared by the World Health Orginasation to be environmentally near perfect Javea is the finest resort on the Costa´s Spains unspoiled stretch of Mediterranean coast shimmering in the sun with lovely beaches of soft sand, rocky cliffs and crystal clear water. Golf: Many courses available within easy drive of the villa make it the ideal base for your Golfing holiday. We are ideally placed for golf - the nearest, Jávea GC is less than 5 minutes away. A 9-hole course, more difficult than it looks, has superb views of Montgó dominating Jávea (Green fees 18 holes Euros 50). Another 9-hole course is Golf Ifach (c.10 minutes, green fees 18 holes 35 euros). Towards Denia (c.15 minutes, green fees 18 holes 70 euros) is La Sella GC, a beautiful 18-hole course. Further afield (c.35 minutes) new course at Oliva Nova north of Denia (18-holes, designed by Ballesteros) & south of Valencia, the famous 18-hole championship links course at El Saler. Many other courses to the south of Calpe, to and beyond Alicante. Handicap certificate recommended. OTHER FEATURES: The local railway (The Limón Express, single-track running from Denia to Alicante) stops at nearby Teulada & Gata providing a delightful ride to north or south. With a 2 week stay, there will be a linnen change after the first week. The stated price is the final price including use of airconditioning in all bedrooms, wifi internet etc. (No hidden costs).